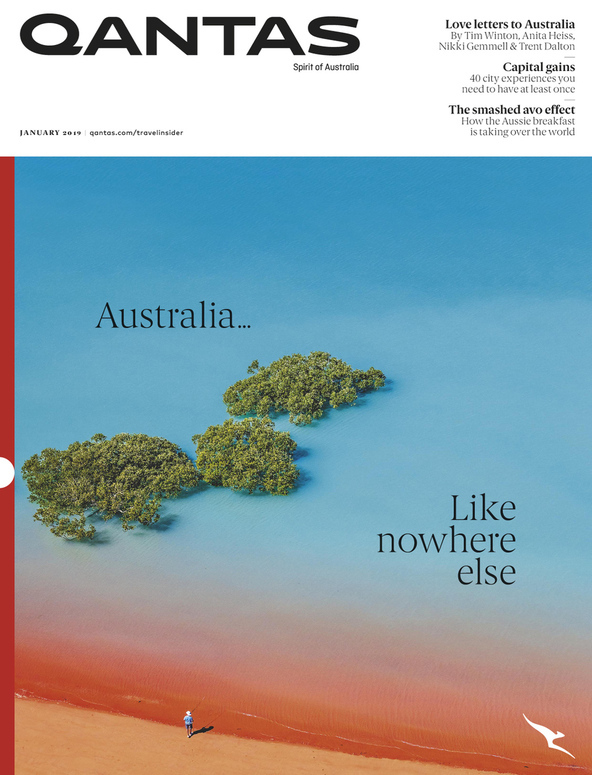 QANTAS Airlines Business Podcast with Alan Kohler. Alan:	This is Talking Business, I’m joined now by Paul Allen, who is the CEO and founder of Margin Partners. G’day, Paul. Paul: Good Morning. How are you? Alan: Margin partners is all about consulting to improve margins for B2B businesses. But I’m interested you spent your life in marketing. Companies like Lion and Tabcorp. You’ve been in paper as well. But what made you do this? Paul:	Well, I think over the years working in companies like that, you come across a range of interactions with very large customers, very large suppliers and overtime you get to see, I guess how the games are really played. All too often businesses focus on the top line of the P and L on revenue quantity, volume, pricing. But so much value gets traded on a daily basis between businesses below the gross margin line. And it’s always struck me that there’s more value to be had there. Alan: So you make a big distinction between gross margin and net margin. Alan: So tell us, explain the difference. Paul: Well, you take a large company that’s supplying glass bottles to a brewer, when they’re supplying bottles, they generally look at the gross margin, how much in theory should we make when we sell the bottles. With gross margin, we’re talking about the price for the bottles minus the cogs (cost of goods sold), but generally that’s a theoretical assumption because in large organisations you have many functions like logistics, operations, quality, many touch points that on a daily basis serve that customer and many variances take place in what you originally thought should happen as far as how that customer should be served and it costs you more than what you think. So unless you look at net margin as a measure of customer profitability, you’re often not seeing the true money that’s coming through when you sell something. Alan: So, is it more than simply taking notice of your overheads? Paul: Oh, absolutely. It’s overheads, but it’s also not charging potentially for the additional services that you may provide. In B2B supply, for some reason, there’s this lack of accountability, unlike in BTC, where like if you take, for example, buying airline fares with Quantas, you can buy one of four different fares to fly from Melbourne to London and each comes with a very distinct set of rules and conditions, but in B2B we tend to say we’ll allow people to pay for an economy seat, but actually everyone wants to fly first-class and that’s where value gets lost. Alan:	It sounds a bit like you’re helping companies on both sides of the ledger. You help them with their cost, but you also, it seems to me, advocate or help them increase the prices where appropriate. Paul:	Advocate is the key word. I mean suppliers for some reason in Australia are often timid or a little bit subservient to customers and what we do is empower them to say, look, you are undervaluing at times the value you bring to a customer. Alan: What, they lose the contract? Paul:	Not necessarily. I mean, we fail to realise at times how much dependency there is from a customer on a good supplier and there are natural barriers of protection in this country that means you’ve got to hold the customer to account to protect your margin and you can do that. Alan: So how often do you find yourself battling against Coles and Woolworth’s on behalf of grocery suppliers? Paul:	Well, you know, that’s probably a fairly routine thing when it comes to FMCG companies, but it’s not just those we work with. We work with companies that supply to companies that then supply to Coles and Woolies. Paul:	But the principles are the same. I mean, often we blame customers for being difficult or tough, but my message is suppliers need to look at themselves and know their business intimately and know where they’re incurring costs they shouldn’t and not charging for revenue that they should. And it’s about empowering them to stand up and actually own their margin and get people to treat them with respect, the customers to treat them with respect like the famous Dr Phil says. Alan: So, you started the business idea not very long ago, about 18 months now. Obviously, it’s early days, but have you got to the point where you can conclude that it was a good idea? Paul:	Oh, absolutely. We’ve got about six people now. We have someone in New Zealand working with us and the person that wrote the foreword to my book, Take Back Your Margin, is based in Europe, and he and I are starting to do some work on those, but on this type of concept there as well. So we’re getting good momentum. Alan: I’ve got a copy of Paul’s book in front of me, Take Back Your Margin, and the subheadings are 10 pitfalls every vendor must overcome to protect their profit. For B2B suppliers who are fighting to retain their margin. And Paul Allen listed as Australia’s leading authority on supplier margin. Is this a specialty that you’ve invented or is it something that is a preexisting around the world? Paul:	Oh, look, arguably, I can’t comment on around the world, but I can certainly say I think you have moments in your career and your work life where you just strike on something and go hit on something that says, you know what, I see this very clearly and, and I was involved in a billion dollar negotiation with what is AB InBev, and the customer came knocking and said we would like you to give us an extra $5 million in savings per annum. Paul:	And before handing that money over—I was the head of sales at the time—I actually did this trawl through our business and spoke to about 30 people that interacted with that customer in Australia on a daily basis. And what I found, and we’ve valued this, is that we were actually giving the customer some $10 million of benefit per annum. But no one knew about it. No one actually knew what was taking place. And this really struck me and was the impetus for the business to say, you know, you’ve got to look below the line and see what people in the factories, in the logistic centers, in other parts of your company are doing because that’s where value is created. Alan: That was $10 million of quantifiable value that the company was giving but not charging for? Alan:	So, what did you do then? They’ve asked for $5 million price category. Paul:	What? Then we went back and explained it. I mean, you’ve got to be obviously very sensitive and careful in dealing with customers of course. But we went back and showed them, for example, we have trucks circling breweries at all hours of the day, encouraging demurrage charges when we shouldn’t. We are changing production schedules to supply you with only a day’s notice when it should be five days’ notice and we’re incurring all this cost. So we’re able to go back with metrics and this is the key. You’ve got to have the metrics to explain what you’re doing. But we could show them where the dysfunctions were taking place. And as Richard writes in the book, Richard Von Breda, he says, look, we were able to see it. He held a mirror up to us and we were able to respond to it. Alan:	And so what happened? Did you just get knocked back there? 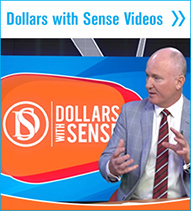 You were able to knock back the $5 million demand, or did you actually get them to post? Paul:	There was a very mutually agreeable agreement was reached around that. They acknowledged what we had, we acknowledged what they were doing, and we found our peace on it in a really constructive way. Alan:	You’ve got a few case studies on your website. That’s one. Obviously it wasn’t a case study for your business, but it happened in your past. Tell us a case study or two from you, something from the past 18 months. Paul:	The issue was, once we took him through the contract, he realised that the customer never paid to receive all. They had taken everything that the company was giving. So, he’d been overservicing for so long, incurring overtime and other costs without holding the customer to account. Now that finding alone was worth roughly a million dollars to reclaim very easily just by holding the customer to a contract. Paul:	Yeah, but that’s the issue, right? A lot of people get stuck in head office, like you have the commercial guys at head office dealing with their procurement counterparts. They don’t go below the surface and actually find out what’s really happening out in the trenches. And once they do, you can start a constructive discussion and you say, “We’ll give you what you want, but it has to be done on our terms” because you’ve always got to maintain your margin. Alan:	So how much of the time is your work involved in getting the supplier to stop doing what they’re doing? Or how often is it to get the customer to pay for it? Paul:	It very much starts with my customer first. They’re like a golfer, and we’re like a golf coach. They invite us in and say, “Hey look, we’re really good. We play with a handicap of one, but we want to win the big tournaments, show us what we’re doing wrong.” So we work with them first to say, “Hey, look at your stance in the bunker or the way you’re putting.” We have to put a mirror up to them to show them what they’re doing wrong. And then they want to take it forward and actually make those changes. But sometimes they ask for coaching, like how do we broach this with a customer, how do we do that? It depends on where they are with that in their own game. Alan:	And do you ever represent them in the negotiations with their customer? Paul:	From a distance. Our intention as Margin Partners is to empower them to actually manage their own business and play better. So we coach and guide them through it. Alan: Right. So, how many customers have you picked up in 19 months? Alan: And are they generally large, I suppose? Paul: Generally large revenues, usually over $50 million. The largest has been up to around $1.4 billion. Alan:	So, clearly you’re on the growth path. It’s a good idea. Alan: I must say it sounds to me like what you’re doing is making up for poor management in a sense. I mean, this is really what all managers want to know—what’s going on and what the real costs are. That’s the basics of manufacturing. Paul:	You could say that, but there’s a bit more. It’s very hard like the golfer—when you’re playing the shot and you’re there in the tournament, it’s hard to know whether you’re standing properly on the tee. Every company, every person has blind spots, and sometimes it takes a third party to come in and actually see where it is because there can be years of dysfunction that have just built up. You don’t realise what you’re doing until someone holds up a mirror. Alan:	How do you charge, by the hour or taking a percentage of benefit? Paul: We take a percentage, so we have a retainer. We work on a model where there’s a base retainer, but we work with companies that are after the high reward and we take a share of that reward, which means we have to deliver the reward. Paul: (Laughing) Uh, I won’t comment on that share, but it’s material. Alan:	(Laughing) Right. Is it half? Alan:	That’s great. Well, good idea, Paul. That’s a good business. Good book here, too. Everybody, if you’re interested, where do you get the website? 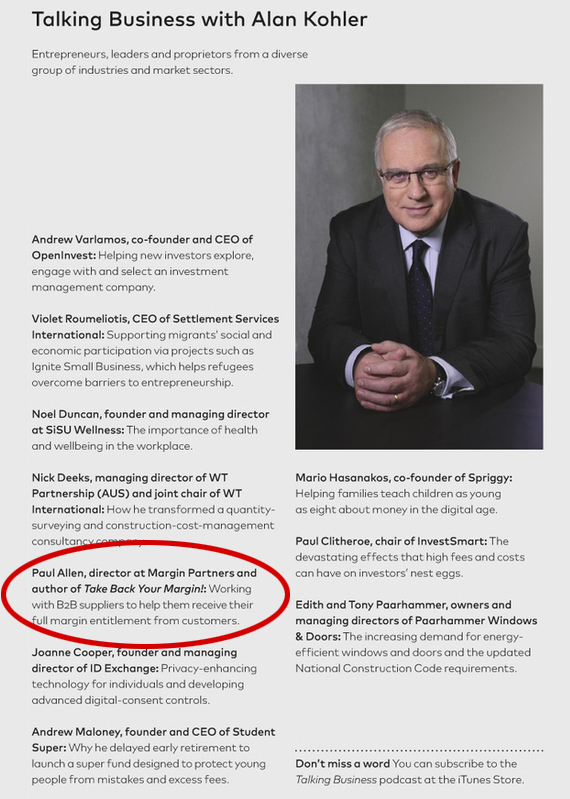 Paul:	Marginpartners.com is the website. Alan: You can order the book and there’s a fair bit to read on their website as well. That was great. Thanks very much, Paul. Alan: I’ve been talking to Paul Allen, the founder and CEO of Margin Partners.